WASHINGTON (CNN) -- Last week's "balloon boy" incident is being investigated by the Federal Aviation Administration, an agency representative said Tuesday. The Heene family -- including Falcon, second from right -- on CNN's "Larry King Live" last week. 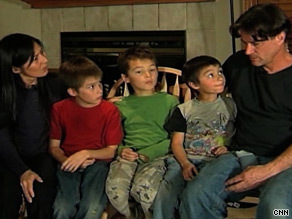 Richard and Mayumi Heene, whose son Falcon was thought for several hours to have flown away in a homemade balloon, are facing a number of local charges, a Colorado sheriff said this week. The Fort Collins couple could be charged with conspiracy, contributing to the delinquency of a minor and attempting to influence a public servant, Larimer County Sheriff Jim Alderden said Sunday. The family also probably will be charged with filing a false police report, which is a misdemeanor, Alderden said. FAA spokeswoman Diane Spitaliere confirmed Tuesday that the agency was "investigating the circumstances" of the incident, in which police and military scrambled to rescue the 6-year-old boy, who later turned out to be hiding in his family's attic. A source familiar with the investigation said no record has been found indicating that Richard Heene called the FAA. The agency does not record all of its calls, and the search for a record of any call is continuing, the source said. CNN's Mike M. Ahlers in Washington contributed to this story.